All I wanted was a hat to pull down and keep my ears warm, when it started to be freezing this February. This pattern reminds you of my RISPEN pattern? Well, it´s just another version but with little trees and bushes! For some time now I have been looking for a pattern for this wonderful speckled yarn, made by Walkcollection. 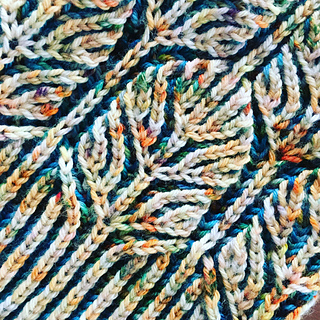 This pattern came coincidentally, when I was trying to find something different… but I am more than happy how it worked out! The hat has a brim, is very stretchy, slightly slouchy and well-fitting at the same time. It´s definitely long enough to keep your ears warm, when a strong north wind is blowing in February. 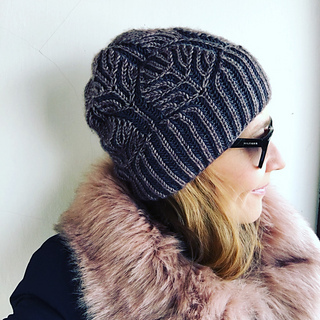 The pattern is based on basic brioche stitches, increases and decreases. You should know that there is a br 4-stitch-decrease to be knit. You can do it, knitters! Shown speckled version was knit with Walkcollection Merino DK ( 100% Merino, 225 metres / 100g) in Sprinkles (MC) and Treasure Island (CC). Shown tonal version was knit with The Wool Barn Yak DK ( 60% Superwash Merino, 20% Silk, 20% Yak, 231 yards / 212metres / 100gr) in Wild Berries (MC) and Charcoal (CC).